Chris Gibson - The Natural Expert: Want To Get Off The Acne Treadmill? Want To Get Off The Acne Treadmill? Wow, what a week so far! As most of you know I live out in the countryside and grow a lot of my own foods. I love summer because it allows me to get outside and enjoy nature. Since my mom's passing this spring, several friends have pitched in and helped me get the place back in shape. I had to concentrate on caring for my mom last year and had gotten behind. 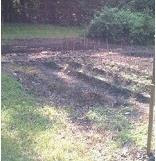 We recently put in an organic friendship garden (the picture to the right shows what we have so far). The idea of the friendship garden is for all to share the work and harvest. This will be fun for sure. Working on a garden alone can feel like a treadmill, which by the way got me thinking about how so many of my clients are on a treadmill of sorts with their breakouts. Not a day goes by that I do not hear some pitch from some acne product company about how they will "make your acne go away" or some "million bottle give away" in order to entice new and unsuspecting acne sufferers. I remember this treadmill well, I was once on it. It doesn't work, as one of my friends (Kyle) was telling us his Proactiv experience this weekend. The acne product advertisements make me so angry that I have to turn the radio down now when I hear them. "I went down and bought the stuff at the mall and tried it. The first week it seemed like my skin got dryer and my skin broke out less, but the second week I got a ton more zits and they were deeper than what I had previously. I stopped using the stuff and my skin at least went back to where it was. Then I started using your Ginale and my skin started to clear up. It did not happen overnight (took a few weeks), but now I understand how healthy skin is supposed to be." ALL commercial acne medication products (please check the labels on your own here) have the SAME two ingredients, benzyl peroxide and salicylic acid. The first is supposed to reduce bacteria and the second dries up oily skin. The problem is that they are both harsh and over-dry the skin. This leaves a lot more dead skin cells on the surface that trap more oil and provide a great environment for bacteria to fester and grow. Thus the treadmill. You try the product, it works somewhat for a week or two, and then you're right back where you started or worse. I hear from thousands of clients every year about this very same experience. It is time for it to stop and for you to get off the Acne treadmill. You are probably thinking right about now, "Chris how can I do this?" First, stop wasting your hard earned money on the kind of products with these ingredients. Then, switch to using chemical (soap) free products you can trust like Ginale. Finally, institute a good daily exfoliation plan (like the Ginale Skin Peel) and clean up your diet! Your skin will respond, and your acne will clear up and stay cleared up. I'll keep sharing with you how to do this and if you make the changes, your skin will change for you. It happened to me, Kyle, tens of thousands of my clients, and it can happen for you as well.